With a game that happens to be such a big deal as Red Dead Redemption 2 (or RDR2 if you're one of those cool kids), it makes sense that Rockstar Games would see fit to release numerous editions of the game, in order to make the most of the ever-increasing hype. As such, Rockstar has indeed announced its pre-order bonus and special edition plans for Red Dead Redemption 2, and they are numerous. On this page, we'll take you through each edition as well as the advantages of each one. Given that few games come with as much hype as Red Dead Redemption 2, perhaps this is a game worth splashing the cash on to get that more exclusive limited edition. First up is the pre-order content you get by pre-ordering any edition of the game. This will be the content you can gain access to by simply pre-ordering any edition of the game ahead of its release. Bonus GTA$500,000 to spend immediately in Grand Theft Auto Online. After pre-ordering your copy of Red Dead Redemption 2 through the Microsoft Store on Xbox, this GTA$500,000 bonus can be downloaded by searching for "$500,000 for Grand Theft Auto Online" on the Microsoft Store. Bank Robbery Mission & Gang Hideout in Story Mode: Get exclusive access to a Bank Robbery Mission, in which Arthur and a couple of his fellow gang members come up with a daring plan to break in and rob the bank in the southern town of Rhodes. Elsewhere, the Del Lobos Gang has taken over a hacienda - clear this gang's hideout and rob their stash for a lucrative take. Gameplay Boosts, Cash Bonuses & Discounts: This collection of exclusive Story Mode boosts, bonuses and discounts will help Arthur to survive out in the harsh wilderness and better provide for his gang members and their camp. The Core Stat boost benefits Arthur's Stamina, Health and Dead Eye Cores. Earn more cash during robbery missions with the Van der Linde gang, and when hunting and selling animal carcasses. Receive discounts on all upgrades to the Van der Linde gang's camp, and much more. Plus Get Free Access to Additional Weapons: A good range of weapons is essential for survival in the Old West. Get free access to three weapons at the in-game Gunsmiths in Story Mode: the robust Volcanic Pistol, devastating Pump Action Shotgun and versatile Lancaster Varmint Rifle. Bonus Outfits: Get two exclusive outfits for your online character. The Blackrose Bounty Hunter Outfit features a long oxblood-colored coat and a vest with gold pocket watch chain. The Copperhead Enforcer Outfit features a fur-lined saddle-brown leather waistcoat and two-tone gloves. Rank Bonuses: As a great start for all Ultimate Edition players you can rank up faster in online, up to rank 25. Plus get free access to three weapons at the Gunsmiths in Story Mode and online: the robust Volcanic Pistol, devastating Pump Action Shotgun and versatile Lancaster Varmint Rifle. 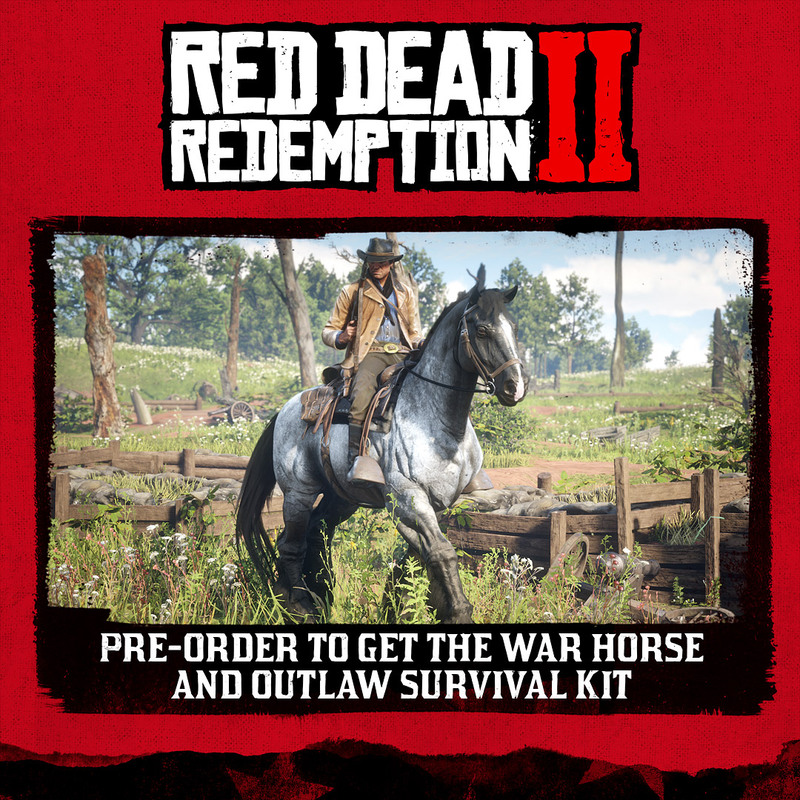 In addition to the various versions of the game itself, you'll also be able to purchase the Red Dead Redemption 2 Collector's Box. This box of physical trinkets does not actually include a copy of the game, but will probably contain enough stuff to satisfy die-hard fans. Pin Set: This set of six individual pins includes representations of key weapons from Red Dead Redemption 2 including a shotgun, revolver and Dead Eye "X" marker. The set comes in a canvas carrying bag. We'll be keeping this page updated with the best prices and offers as and when they arrive, so be sure to bookmark this page and come back as we approach the game's launch in order to make sure you get the edition you want and don't miss out. In the meantime, you can checkout the rest of everything we know about Red Dead Redemption 2.